Well, this morning, I optimistically approached the scale…knowing my last weigh-in on Saturday was 197, I had big hopes of another 2 pounds lost. I was underwhelmed by the number, 200, ya’ll. Slap in the face. Is it my fault? Yes. Am I ok with it, YES. Here’s why…. I am an obsessive self weigher, I would love to tell you that I’ll put the scale away for the next two months 12 weeks and confidently know that I’ll reach my goal, but let’s be honest. The scale is my accountability meter. Without it, I am lost. What I don’t have is an emotional breakdown every time my weight fluctuates, which is daily, sometimes hourly (and sometimes like this mornings weigh in at the box, it changes every 30 seconds). Is my weight an emotional issue? Yes, absolutely, but the number is not what defines me. At this moment I am the smallest I have EVER been, and I have gotten here by working hard and eating right. I am not on a fad diet, I am not counting calories, I am simply eating to live well and really that’s the point of all of this…to live the best possible life (not live a life of punishment and depression over a number on the scale…) and find my best body. I am willing to let it take the time it needs to take, because once I reach that goal, there is no place to return to. Every change I am making is permanent. I say all this very diplomatically as I stand at the precipice of my final push, I am about to finish my fat loss over the course of the next twelve weeks, and I couldn’t be more excited. #1 Paleo isn’t a weight loss program, and although it’s unlikely I would get fat on paleo, if I eat too much or not at the right times, I will not see the scale move in the direction I would like. Case in point: I found these awesome sweet potato chips and I felt like a complete genuis. YAY! I love chips, I’ll take chips over sweets any day, and these are paleo, which in my head=healthy! Except for one thing (aside from the fact that they are fried in canola oil) they are a useless food for me. Yes, they made me happy, but I still ate too many. I think it took me two days to eat the entire bag. I am not proud of this, but I find it’s important to be honest, because I think we all face the same issues with food: it’s freaking delicious and a lot of times I eat to please my palate, not to fuel my weight loss. So, lesson learned; just because a food fits the profile of “paleo” doesn’t mean I can eat unlimited quantities with no consequences. #2 I must, must, must eat a big raw veggie salad at least once a day. My body functions better, I don’t feel bloated and all systems are a go! This is especially critical if I am increasing the amount of red meat in my diet. Red meat takes longer to digest, making me feel fuller longer, which is excellent, but it can also make me feel a little bit sluggish. If I pair it with fresh food I feel much better, and more alert. #4 12 weeks is not a long time, and yet it’s enough time to reach the goal that I have been working on for 3 1/2 years and been dreaming about since I was 11. 12 weeks. I am allowing this to sink in, I am trying not to cry. Love this! 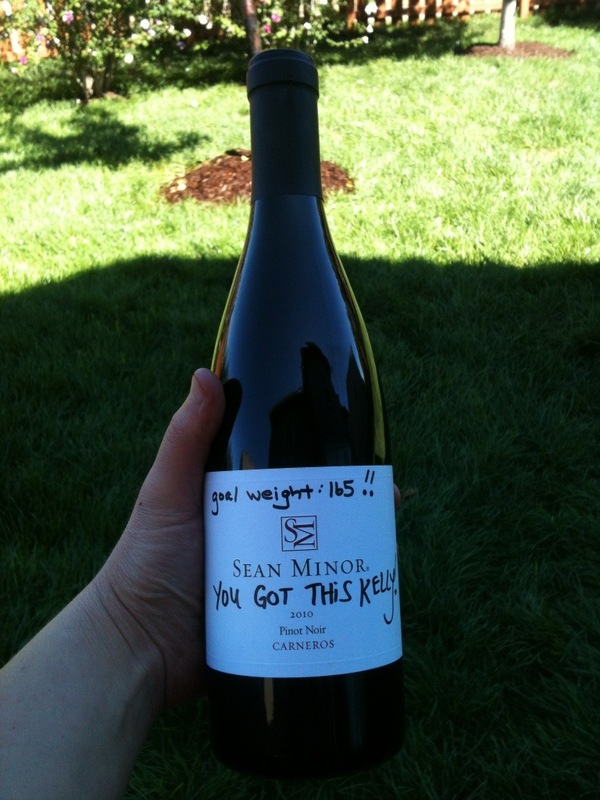 Love the note on the wine bottle. I have the exact same problem when I have my wine. I think I might have to copy this idea! Love it! Tonight has been a true test, I am writing, cooking, cleaning my kitchen and trying to stay occupied. I love my glass of vino! I can totally relate to you on the wine thing. One glass turns into 2 turns into 2 or 3 bottles a week for me. I had to give it up to start progressing forward again. Good luck on your journey, I’m sure you’ll make there before you know it!